Fort Ord, located in Monterey Bay, California, ceased military operations in 1994. The land is now managed by the National Landscape Conservation System as Fort Ord National Monument. The area has a large nature reserve to protect the endangered Smith's Blue Butterfly. Many other endangered species can be found on the property. 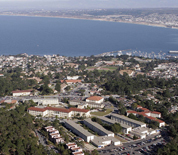 Today, the base is composed of several remaining military facilities as well as a campus of the California State University, Fort Ord Dunes State Park and the Veterans Transition Center. This Fort Ord directory features the critical info you’ll need to navigate through the many facilities and recreational opportunities available on base.